The ways in which Elsa and Anna overcome fear, fury and self-doubt are at the core of Disney’s “Frozen: The Musical.” But what spurred these soul-bending emotions? What was their origin? That’s where this story of sisterhood and the unbreakable bond of love it creates between two orphans takes shape. Ultimately, that’s why this story has connected so vividly, and so universally, with those who experience it. And that’s why we dove deeper than anyone else to get to it. So welcome to your seat, enjoy the show. 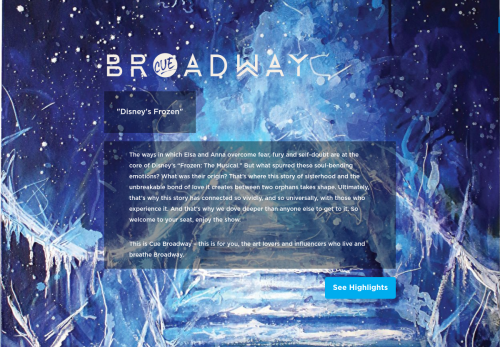 This is Cue Broadway – this is for you, the art lovers and influencers who live and breathe Broadway.